users. 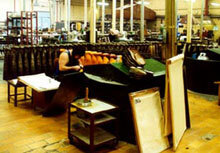 People soon discovered that natural rubber had distinct advantages over any other product on the market. 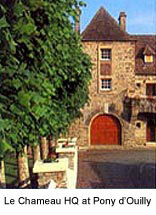 Today the processes initiated by Claude Chamot have been refined and developed to create the finest natural product available for protection against the wet. Today, careful selection of the very best materials coupled with the high-precision boot-making methods support a tradition which Le Chameau have always taken great care to maintain. With their long experience of boot-making they are constantly innovating, combining the best materials with their total mastery of modern technology. 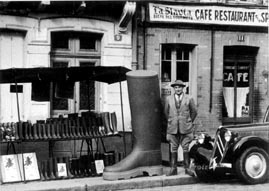 Le Chameau boots are now sold in 25 countries around the world. Where it all begins......natural rubber in it's raw state taken from the 'hevea' - a native tree of tropical Amazonia. 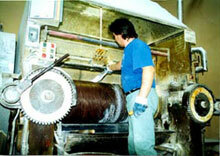 Rubber is softened, smoothed and mixed with natural dyes using large rollers. 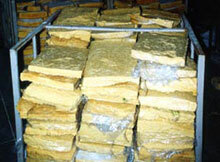 Mixed compound is then finely rolled into sheet rubber, which will form the main body of the boot. Stringent quality control ensures against any bubbles or dye marks. Faulty pieces are cut out and recycled. 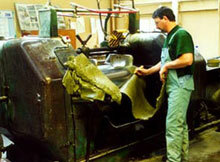 Rubber is then cut into lengths for assembly. All the component pieces for one pair of boots are placed into a 'pattern book'; each section is separated by a calico 'page' to prevent sticking. 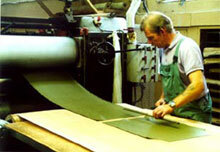 Cotton, neoprene or leather linings are hand cut and put onto lasts before final assembly of the rubber boot. 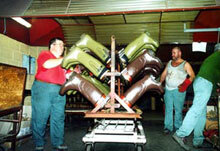 Highly trained assemblers make up the boots using traditional skills and tools. 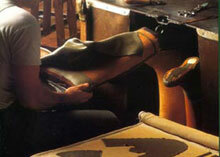 Here you can see the 'pattern book' and the assembly of a pair of Chasseur boots. Finally the boots are vulcanized at high temperatures. They are removed from their last; zip openings are cut using large scissors and an experienced 'eye'; tops are trimmed and final quality is checked before the boots are boxed and despatched.